The begining of a family adventure. Photo by Francisco Tentes. For years, Rahua co-founders Anna Ayers and Fabian Lliguin have been traveling to the Amazon on business. The star ingredient and namesake of their natural beauty line comes from the ungurahua nut, a treasured resource they learned about through tribal communities. When it came time to plan a family vacation with their two-year-old daughter, the rainforest felt like the obvious choice. Anna tells us all about their trip. So, what brought you to the Amazon rainforest? 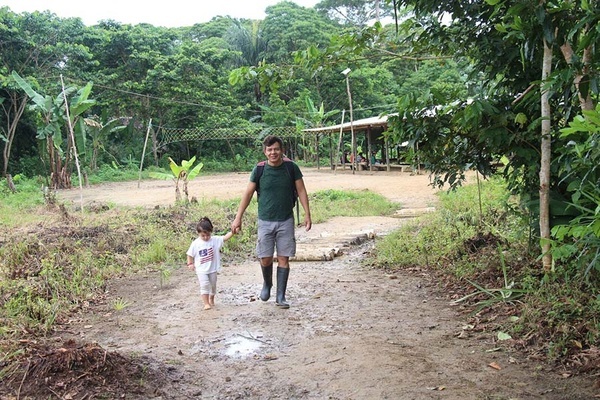 My husband Fabian has been doing environmental work in the Amazon rainforest since the 1990s. Over time, he has developed trusted and valued relationships with indigenous leaders and because of this, we were invited by a tribe to visit. We were overdue for a family vacation and decided it was time our two-year-old daughter, Bella, learned about Rahua, our family business and its activism efforts in the Amazon. We want all that we do to feel as natural to her as it does to us. Our work takes us deep into the rainforest, so getting there was a bit of a process. 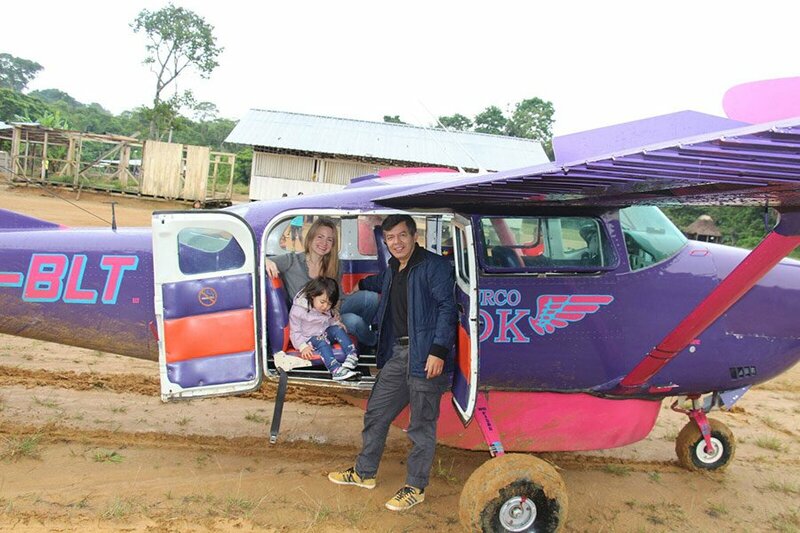 First we flew from New York City to Quito, Ecuador, then we boarded a seven-hour bus to the rainforest airfield, followed by a small passenger plane to a landing strip close to the Achuar village where we stayed. We then walked through the jungle for four hours before we arrived at the village. Since it was Bella's first foray into the Amazon, we decided to break the trip up a bit and ease her into the jungle. Our first night was spent with my husband Fabian's family in Quito. The next few days were spent working with members of the tribe in the village we were visiting, making pottery, learning how to use a blow gun, practicing traditional face painting, and doing a whole lot of laughing. Spoken language is not the only form of communication. Watching my daughter frolic with the children of the village showed me that we are all connected in a very intuitive way. Children inherently know this, but adults somehow lose sight of it. When we arrived, the village had prepared a feast, and the entire community was present. It was wonderful to sit down and enjoy clean, delicious foods prepared by loving hands. 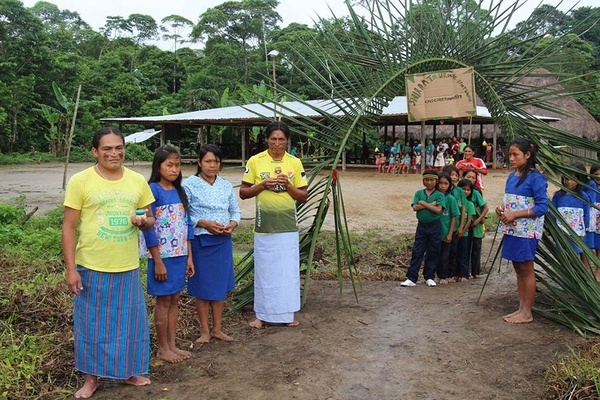 There is a drink named chicha, which is ceremonial and prepared by the women of the village. Each woman has her own recipe and is very proud of it. Sleeping on a bamboo platform while hiding from mosquitos in our mosquito net. 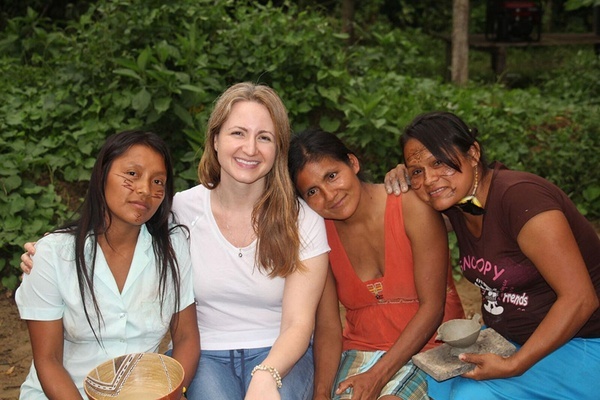 Anna with the women she works with in the Amazon. Photo by Fabian Lliguin. A warm welcome from the locals. Photo by Fabian Lliguin. Showering in the river was a highlight. It was a beautiful moment to relax in nature and was restorative and replenishing. Unlike New York City, there are no car noises or construction machinery — just the sweet sounds of the jungle. There is a tradition of making pottery with Amazonian clay, which is fired and painted by hand. I learned that the women use strands of their hair to make paint brushes to create fine lines on the pottery. 1. Meal: Freshly-caught fish from the river cooked in banana leaves and lemongrass tea. 2. Thing you did: I experienced an ayahuasca ceremony. It was magical. 3. Casual hangout: The hammock in my hut. While trekking to the village, we had to cross the river in a few places, and I was really surprised to find that the "bridges" our guides often referred to were no more than thick, mossy branches. I had a very spiritual experience when I participated in an ayahuasca ceremony led by a shaman. I had been guided on what to expect, but nothing can really prepare you for the sharpness and clarity that I felt afterwards. Fabian and Bella taking a stroll. Photo by Anna Ayers. 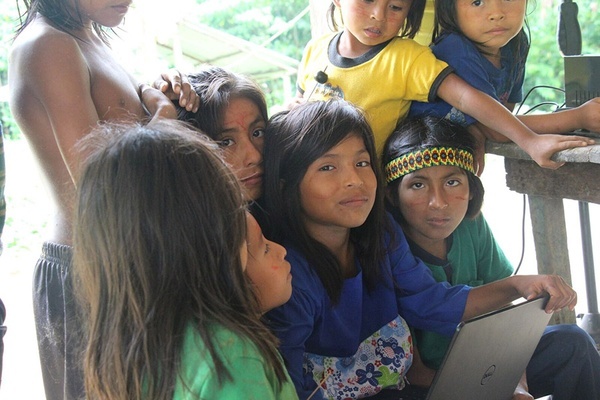 Tablets have made it as far as the Amazon rainforest. Photo by Fabian Lliguin. The warm welcome from the entire village when we arrived. Set aside your expectations because anything can happen; be humble, nature will guide you; and pack light and waterproof. Your gear can become quite heavy if you trek far into the rainforest like we did. I will always go back. Preserving the rainforest is in Rahua's DNA and part of the reason we started our company. Our goal is to protect it and the people who inhabit it. Anna is a beauty and trend visionary in New York City and the co-founder of Rahua, a beauty line made with ingredients from the Amazon. She travels for the inspiration and betterment of our planet.